Go Vietnam Soccer Team! Final Match Is Waiting! Vietnam knocked out the Philippines 4-2 on aggregate to advance to the 2018 AFF Championship’s finals after a 2-1 victory in the second-leg semifinal in Hanoi on Thursday. The home side entered the game with a 2-1 advantage after the first-leg in Bacolod, the Philippines, last Sunday. But it did not mean the first 45 minutes was easy for Vietnam as the Philippines played a pressing style, readily approaching the Vietnamese players whenever the Golden Stars got the ball. Thus, Vietnam's soccer team play with high focus and care as they try to find a way to approach the Philippines' net. Only until the 33rd minute of the first half when Doan Van Hau raced on the left swing and passed the ball to the penalty box and Striker Anh Duc made an attempt to finish but he was denied by a Filipino defender, saving the away team from conceding a goal, the atmostphere at the My Dinh Stadium was raised with excitement with shouts and cheers. After being held goalless at half-time, the Philippines tried to put more pressure on the home side as they needed at least two goals to advance to the finals. 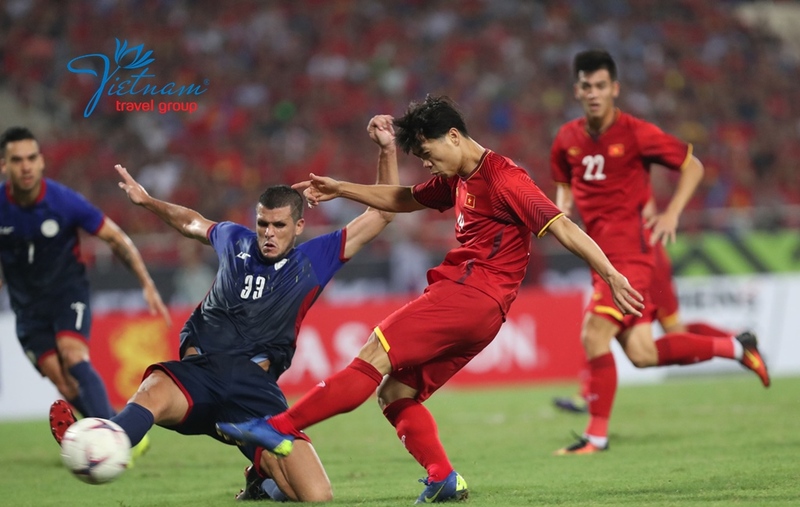 But it was Vietnam who took the lead, with Quang Hai finishing a cross by Van Duc at a close range to gently kick the ball into the Philippines’ net in the 82nd minute. 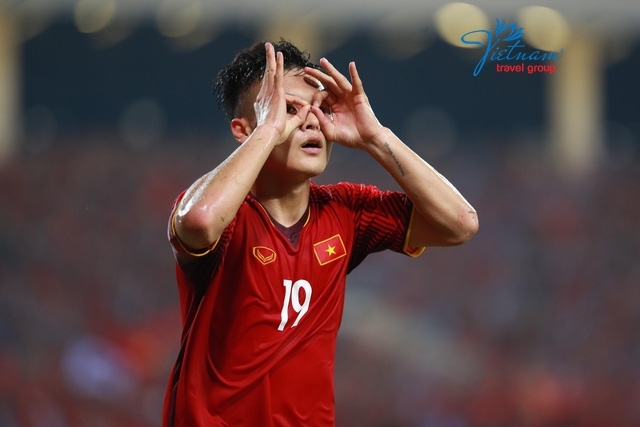 Excitement once again exploded when Vietnam’s striker Cong Phuong staged a solo before making it 2-0 for the home side just 4 minutes after the first score. While Vietnam were still enjoying the two goals, they had to ship a goal in the 88th minute, when the Filipino James Younghusband converted a corner kick, reducing the scoring to 1-2. That was also the final score of the match when the crowd at My Dinh National Stadium burst with joy as the referee blew the whistle. The Golden Stars advanced 4-2 on aggregate to the finals, where they will be challenged by Malaysia. The Malaysians secured their final ticket after holding Thailand 2-2 in their return game in Bangkok on Wednesday, following a goalless draw in the first-leg semifinal in Kuala Lumpur. Vietnam will play the first-leg final on Malaysian soil on December 11, before their return game in Hanoi on December 15. 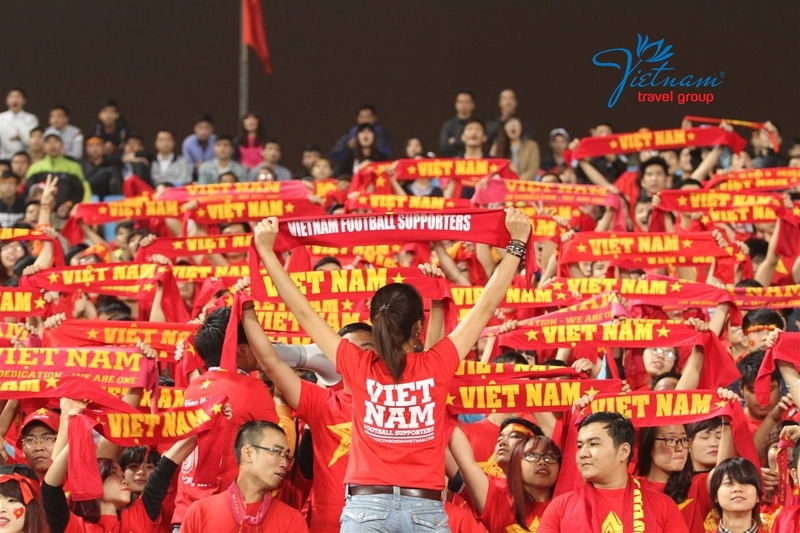 Football fans across Vietnam are celebrating their first final berth at the AFF Championship, contested by ten nations affiliated to the ASEAN Football Federation, in ten years. The Golden Stars won the title in 2008 after beating Thailand 3-2 on aggregate. They are now only two games away from the second regional title in the country’s football history. Join Vietnam Travel Group for the trip to Malaysia to cheer with Vietnam's Soccer Team for the final match on 11 Dec 2018. Contact Vietnam Travel Group NOW!